Dr. David Simons prepares to launch in Man High II (Credits: USAF). A “self-described ‘balloonatic,’” Duke Gildenberg became “involved with scientific ballooning at Holloman (Air Force Base) from its earliest days,” said The Pre-Astronauts (Naval Institute Press/1995). After his war service as a military meteorologist, Gildenberg became “part of the New York University program that had worked on the animal flights with the Army,” and he found work in classified projects. He chose a position with the Naval Ordinance Test Station. His duties were related to the test track at China Lake, Mojave, Calif. Then, in February 1951, Gildenberg went to Holloman where much of his work had to do with previous experience: ballooning. Only four years into the future would men squeeze into gondolas to perform science firsthand. “The U.S. Air Force established Project Man High in December 1955 to obtain scientific data on the behavior of a balloon in an environment above 99 percent of the earth’s atmosphere,” the website nationalmuseum.af.mil documented. “I was involved with all of the Man High flights,” Gildenberg said. Man High I lifted off on June 2, 1957, at 6:23 a.m., from a Minnesota pit mine. “The gondola that we were in was three feet across and seven feet high, which was really smaller than a telephone booth; but we had all the life support systems and communications that we would need to go into a space environment,” the pilot, Capt. Joe Kittinger, said in filmmaker Michael Lennick’s documentary, The Land of Space and Time (Foolish Earthling Productions). The capsule “rose at a steady 400 feet per minute,” but increased to “500 feet per minute as Kittinger approached the tropopause” at 45,000-feet, said The Pre-Astronauts. “Duke had warned us about the potential for 100-mile-per-hour jet stream winds, and at 45,000 feet I prepared myself. 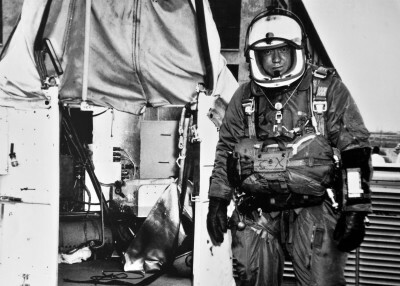 I knew this was the point where most balloon failures occurred,” Kittinger said in Come Up and Get Me (UNM Press/2010). Kittinger became an extreme altitude balloonist. Here he stands next to the Excelsior gondola which, supported by a helium balloon, carried him 102,800 feet above Earth, setting records some of which still stand today. (Credits: USAF). “I was just trying to be funny, and they got a little excited, I guess,” Kittinger said. Regardless, said The Pre-Astronauts, “the oxygen system foul-up had come within minutes – if not seconds – of killing” Kittinger. Maj. David Simons flew Man High II, launching on August 9, 1957 from a Minnesota pit mine as well. Simons was chief of space biology at Holloman’s Air Force Missile Development Center. A storm, which Gildenberg forecasted, was brewing. At liftoff, the balloon hoisted the gondola at 1,100 feet per minute. 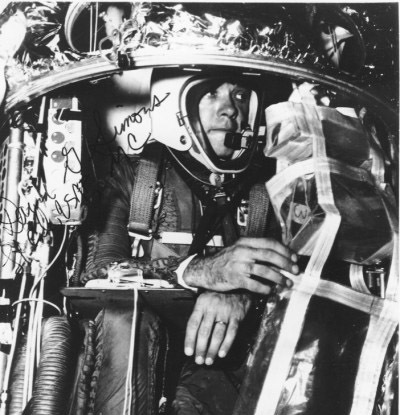 Two hours and 15 minutes later, Simons reached apogee at 100,516 feet, setting an altitude record. That night the extreme cold so deflated the balloon that Simons dropped to 68,000 feet. 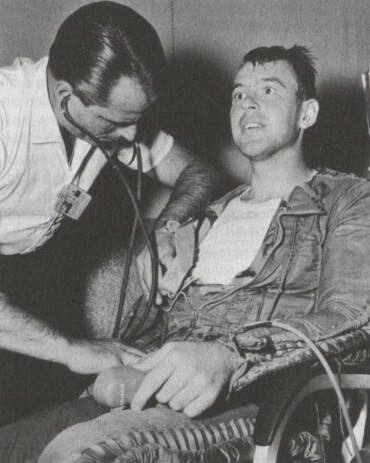 A doctor examines Lt. Clifton “Demi” McClure after his Man High III mission. His parents nicknamed him Demi after he was born on the night Franklin D. Roosevelt, a Democrat, was first elected president (Credits: USAF). The final Man High left Earth on Oct. 8, 1958, from Holloman. Gildenberg, in his oral history, said he and other scientists and doctors were aboard a circling cargo aircraft, monitoring pilot Lt. Clifton “Demi” McClure. McClure topped out at 98,850 feet. Stay tuned for the third and final installment in this series.